Free-Speech Debate In India Heats Up : The Two-Way The recent case involving the arrests of two young women over a Facebook post has touched off a broader debate in India, a country with millions of tech-savvy young people. 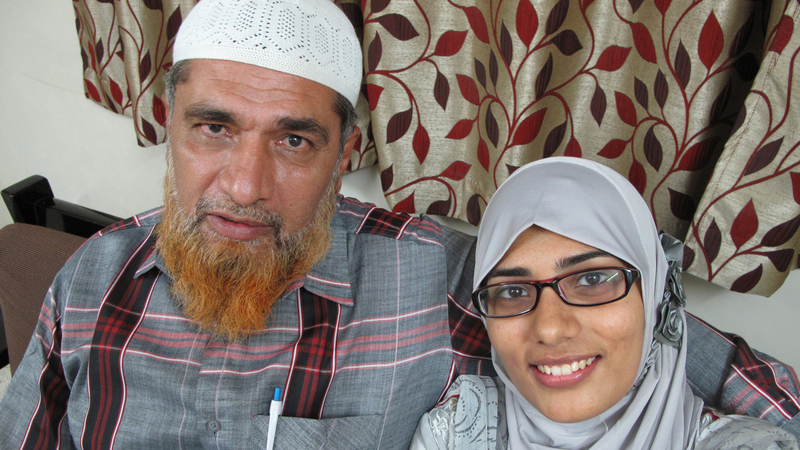 The case against Shaheen Dhada has set off a free-speech debate in India. Her father, Farooq Dhada, shown here with her, says in India, freedom of speech "exists only on paper." It looks like the case in India against two young female Facebook users has been dropped. But the debate over free speech in India is still heating up. As we've reported, two young women were arrested last week for a Facebook comment that criticized the shutdown of the city of Mumbai for the cremation of a controversial political leader. One woman wrote the post; the other merely "liked" it. Authorities now say the case against the women, Shaheen Dhada and Renu Srinivasan, will be closed. Earlier this week, two senior police officers were suspended for "unlawful" arrests. The two women reportedly will also receive compensation. The public backlash against the case has forced a new scrutiny of the country's Internet laws. On Friday, India's Supreme Court took up a petition to review the measure that has angered Internet activists. They say the law criminalizes electronic speech that causes "annoyance or inconvenience" or that is "grossly offensive." Shreya Singhal, a 21-year-old university student from Delhi, petitioned the Supreme Court saying she was "enraged," by the misuse of the law. In her plea, she contends that the measure, known as Section 66 (A), "was so wide ... and vague and incapable of being judged on objective standards, that it is susceptible to wanton abuse." Referring to the case against Dhada and Srinivasan, the chief justice of India, Altmas Kabir, said that "the way the children were arrested and treated like criminals outraged the conscience of a major section of society." When the attorney general told the court that the law was "well-intended," the chief justice begged to differ. "No, the wording is not well-intended. It can be abused," he said. The government, meanwhile, has offered to tweak the controversial act, saying criminal complaints would only be registered with the permission of senior police officers. But the government has not amended the terms in the section that are said to be vague and subject to interpretation. Supreme Court advocate Nikhil Mehra wrote this in the Hindustan Times: Suppose "you post a status update on Facebook or upload a tweet suggesting that your local shop owner has caused you grave inconvenience by refusing home delivery?" He can claim that he finds it an annoyance that "you spoke brashly," says Mehra, "and potentially have you arrested under 66 (A)." Amid the growing campaign against India's law governing cyber speech, hackers are reported to have attacked and defaced the website of the country's information technology minister, Kapil Sibal. India's Computer World magazine reported that the "about" section of the website described Sibal this way: "Born with a below-60 IQ, he thought he could mess with the Internet and let the elite of his party suppress freedom of speech."